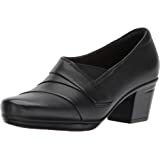 This shoe is comfortable, fits great and looks great on my feet. It fits perfectly and is very comfortable. A supple leather shoe designed for maximum comfort. 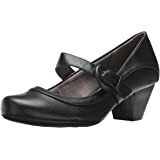 A low, chunky heel boosts height without creating a challenge, and a simple hook-and-loop closure provides an easy and adjustable fit. Layers of Clarks Cushion Soft padding with an impact-absorbing OrthoLite footbed reduce the shock of each step. very comfortable right out of the box. 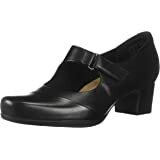 Flexible sole, solid heel, very sturdy shoe. Creases are visible across the top as they are flexible. 2.0 out of 5 starsFell apart after wearing it three times! 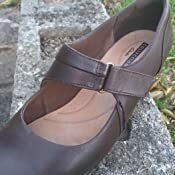 This shoe is comfortable, fits great and looks great on my feet. The only thing is it fell apart after only wearing it three times. The seam on the side of the shoe tore. It makes me wonder about the authenticity of the brand as Clarks shoes are supposed to be really strong shoes. 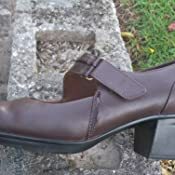 I love these shoes, as I've loved almost of my Clark's! They're super comfortable right out of the box. Fit perfectly. 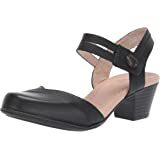 I've recently had to downgrade my high heel game, and these make me feel like I'm not in a total flat. Wore them today with a cute, simple fit and flare dress with tights to work. Had a little pep in my step walking in on an uneven parking lot (never fun in high heels) and bopped right up the stairs no issue. 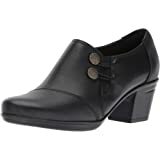 Perfect shoe for the office, thanks Clark's and Amazon! Wore them my first trip working. I am a flight attendant and am on my feet most of the day. I love that the shoes are so quiet when you walk:). So far they are comfortable. 5.0 out of 5 starsVery cute and comfy. 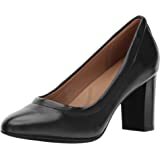 I’m a flight attendant and bought these shoes because everyone said to get them due to them being so good to your feet. 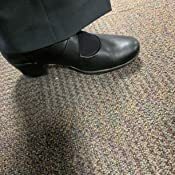 I’m on my feet all day sometimes and have no issues with wearing these shoes for hours. They’re very comfy. They go well with pants or skirts. The price wasn’t too bad at all. I’ve had them for almost 3 months now and they’re still in great shape, compared to the cheap shoes I bought from Kmart. I’ll be buying more of these when the time comes. 5.0 out of 5 starsMost comfortable shoe ever! This was purchased as my 12 year old daughters first heel. I wanted something that was not too high or unstable, and comfortable. This turned out to be the most comfortable shoe I've ever purchased! She had to walk several blocks to an event and did not complain even once about her feet being sore or tight. In fact, she said these shoes were just as comfortable as her tennis shoes, which was awesome news to me!! 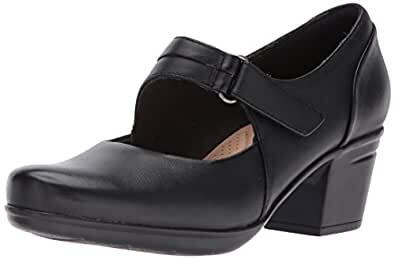 I DEFINITELY recommend this shoe for those who really need a comfortable shoe, which is not too high, nice looking, and able to withstand hours of standing up pain-free. 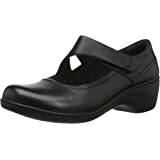 4.0 out of 5 starsA great shoe for all day standing and walking. The shoes are really not bad for someone who is on their feet all day. I walk anywhere between 1-3 miles at work everyday, climb in and out of planes and every other hard thing you can do to your feet. 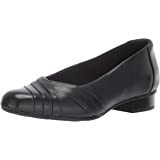 It’s a synthetic upper so it’s a tad stiffer than leather, but they are comfortable. Very stable for walking at quicker paces and uneven surfaces, not slippery and maintains a good image. Once I changed out the insoles due to my higher arches, I can wear them for 12 hours with very minimal discomfort which is unusual. 5.0 out of 5 starsThe foot bed feels like a cloud! I just received these today and I can already tell I am going to love them! I have two pairs of boots from Clark's that are very similar in shape (in the toe box and the shape of the heel). In 2011, I got the first pair in an 8.5 (US) and they fit like a dream. A few years later, I bought the second in a 9 to leave room for thick winter socks thinking that they would fit like the first pair. They were WAAAAY to tight, even while barefoot. This made me second-guess what size to buy for the Emslie Lulin pump. I ordered these in a 9.5M since that second pair of boots was too tight. I'm glad I did because I think the 9 would have been a bit too snug. These have a little room and fit much better. The foot bed is amazing, Clark's needs to put this in every shoe. 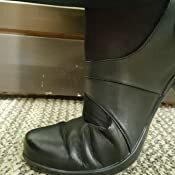 There is a small cushion on the heel to prevent blisters. They are very flexible, as I expected. The leather is very soft, I may put a protective wax on them like I did with my other Clark's. The brown color is pretty close to the picture. I do wish the hook and loop strap was able to tighten a little more, but that is not an issue just more of a preference. 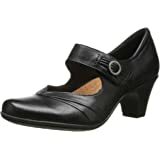 The heel is silent and sturdy, as with most Clark's. They seem well made as well. Overall, I am pleased! They are very simple and clean, which is nice for a casual shoe. If anything changes, I will update this review.